RTC...what an interesting book ! I won this book as a Goodreads Giveaway.So I may have a slight bias towards this book, because I swear it was written specifically for me. I have been obsessed with Velazquez's work since high school, and I've always been frustrated with the dearth of books/movies/anything focusing on the particular time and place in which he lived and worked.In summary, Philip IV and his wife (and niece), Mariana, rule over the last vestiges of the Spanish Empire. Despite being only 2 generations post-Philip II, the dashing and incredibly powerful King of Spain who smashed Mary Tudor's heart into pieces before setting his sights on Elizabeth I (blech), Philip IV's empire, as well as his genetic code, is crumbling. The country is in turmoil, Catalan terrorists plot against them, there are plenty of miscarriages but no legitimate heir, and the royal coffers are empty. However, like many royal households of the time, the King and Queen employ dwarves as entertainment and companions. Maria Barbara, a German, is brought to court to serve the Queen, where she becomes MariBarbola, a prophet and seer. She is quickly sucked into the intrigues and dangers of court life and must learn to play the game in order to aid her Queen - and herself.This book is a definite page turner. My heart was in my throat several times throughout the book, trying to figure out how Maribarbola was going to save herself. It reminded me a lot of reading the Game of Thrones books, where the political intrigue is so twisted and the characters all so likely to be hiding secrets that you end up squinting suspiciously at every person who crosses Mari's path, unsure of who to trust or what game they're playing. Although Patitucci admits in the afterword that several people and timelines had to be jostled around for the sake of plot, she is honest and forthright about what she changes, which I always appreciate because some authors are unwilling to fess up to inaccuracies. And the plot is WELL worth a few character assassinations (though the people they're based on may disagree.) I never knew where the plot was going to take us next, and felt that the characters were expertly fleshed out into real people with real, complex, often grey motivations. It's hard not to sympathize with every person in the book, even when they're being sneaky schemers. My only teeeeensy complaint is that Velazquez himself just isn't in it that much. Since Velazquez is famous for being one of the only painters to paint dwarves, "buffoons," and commoners in general with great dignity, I had assumed we would see some of that interaction. But oh well.Finally, it's the rarest of all books: a novel, with a female protagonist, that DOES NOT HAVE a romantic subplot. Hurrah!5 enthusiastic stars. Oh this was a surprise! Mari is one of the most interesting characters I've read in a long time. A dwarfess who is sold (!) to the Queen of Spain, she is one tough cookie. Imagine this happening to you when you are middle aged and have always lived in Germany. Even in the weirdest of circumstances, the Spanish royal court in the 1600s, she's able to maneuver and keep her self strong. Well researched and wonderfully written, this one will draw you in and keep you reading not only because of Mari but also because of the terrific details. Thanks to Edelweiss for the ARC. This is perfect for fans of historical fiction- especially for those looking for something very different. Finally! This is the one I’d been waiting for! I just love a book that I cannot put down – and The Queen’s Prophet is it! Love the characters. Love the story. It’s a charming mix of drama, suspense, and humor – and perfectly intriguing for anyone who loves to get caught up in a good story. I couldn’t wait to find out what would happen next. Thank you D. Patitucci for this little gem! Based in a time in history that I do not know a lot about. The author enabled the reader to flow right into the story and characters even for one not familiar. A highly recommended read. Maria-Barbara is middle aged when the Countess of Walther, her owner, dies. The Countess’s family doesn’t want her, which leaves her future up in the air. On a trip into town, Mari encounters a traveling street magician who quite quickly convinces her that she could make a living as a seer. Mari takes him up on it, figuring that making her own living, even as a fraud, beats an unknown future. Middle-aged dwarfs are not in high demand in 1600s Germany. Dwarfs of whatever age, however, are in demand in the Spanish court. They are entertainers, dancers, buffoons, good luck charms. The Queen has heard that Mari is a prophet. In a court where everyone is plotting, a good luck charm and prophet can be very useful. Mari is terrified; she knows nothing about prophecy. What will happen when they find out she is a fraud? Some good luck, some knowledge of astronomy and math, and a quick mind help her make her place secure, at least as secure as anyone can be in a court full of intrigue and backstabbing. Even the Queen is insecure. The story was inspired by a painting by Velasquez, ‘Las Meninas’, in which the focal point is the beautiful Infanta of Spain, but rather than focus on her or the Queen, the author chose Maribarbola, who stands to the side of the painting. This outsider’s view of the court has a very different feel from what it would have if the author had made the Queen the protagonist. The story also takes liberties with time; she condenses several years into a short time, making for more exciting reading. The author paints the court of King Philip and his niece/wife Queen Mariana vividly, bringing it to life with lush descriptions of the clothing, the buildings, the plantings, the food, the drink. Lots of food and drink. I knew nothing about this period but found it extremely interesting and I was completely drawn into the story. Mari came to life with her fears, her triumphs, her physical pains, her hangovers, and her concern for the Queen. Four and a half stars. So good I wished it would never end. A fantastic story about an often untold era of Spanish history. Mari's struggles as a dwarf always felt authentic, but never the overly maudlin self-pity that historical novels about a person experiencing injustice often stray into. She's a real person, not a stand-in for general struggle. This was a great read. I was interested from the first to the last page. I love stories based of images, and the use of a painting as inspiration is well done here. I wish the complete painting was included in the book, but minor quibble. The book is clearly not historically accurate, which the author fully acknowledges, so I can't be too picky about that either, although it was clear even to a non-expert in the era that some liberties were being taken. A few language/writing repetition patterns that irked me a tad as well, but considering that this is a debut novel, I generally found the writing quality pretty high and would read more by this author for sure. Very well done. Beautiful book! Exquisite writing, lush descriptions of court life with a unique perspective by a female dwarf assigned to be the queen's prophet. Mari has no ability to foretell the future but through a series of fortuitous events she comes to the attention of the rivals working for the king. This book details what a delicate balance existed in royal courts and the dangers of rising to a position of prominence in any way -- thereby angering hostile figures who are looking out for their own interests. Mari is a woman who would rather not be a hero, but who ultimately saves not only her own life, but others within the court. With this lavish tale inspired by Velazquez' painting "Las Meninas", Dawn Patitucci is an author to look out for in the future. Very nicely done; had intrigue and suspense around how this woman was going to survive in that highly toxic, political and dangerous world -- and she was basically set up to fail, "sold" as a prophet at a time when dwarfs were bought by nobility as pets, prophets, and lucky charms. And one false step could land her in the Inquisition's torture chamber! 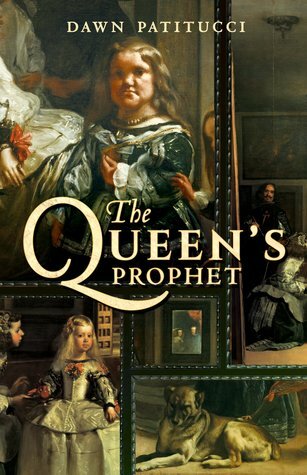 It was also really fascinating that these were real people -- I love that with well-researched historical fiction -- and that the author got the idea for this novel from that famous Velasquez painting. A great debut novel! Character-driven historical fiction gold!Experience the inner circle of dysfunctional Spanish/Austrian royalty through the perspective of Mari-Barbara, a Germanic dwarf trying to cope with her station in life. I own a book of Velazquez' paintings and was actually able to peruse "Las Meninas" while reading the author's depiction of its creation. How fun is that? The whole book was a real joy to read! The incestuous court of Philip the fourth of Spain and all of its intrigue is brought to life through the eye of Maribarbola the queen's dwarf. Just as I have discovered with Marie Antoinette, these rich and favoured people were born to horrors all their own. The trick is to stay alive in a place of rumor and superstition and political maneuvering. Being king isn't all that it's cracked up to be. Thanks Edelweiss for this ARC.Never forgetting the way she was born, Mari takes her role and makes it work for her. Mari is a unforgettable heroine of her story. The queen and king of Spain plus all the intrigues of court make this a great adventure. I enjoyed this fictionalization of the Spanish court and the dwarves in the Velaquez painting. Not a part of history about which I have much knowledge. The book is full of political intrigue and scheming. A well told story. Excellent historical fiction set in Spain. Highly recommend! Enjoyable read- such a different time -1650s, Madrid, Spain in the beautiful Alcazar I've visited. And from the POV of a little person... very interesting. I had to sit on this one for a while and let it all sink in. The main character of this book finds herself in many difficult situations where she is constantly second guessing everything that goes on around her, and that was me reading this book as I wondered which side each character was really on. It was a very enjoyable read with great imagery while also being incredibly moving. Thank you Goodreads giveaways for sending me a copy of this book. Dawn Patitucci - Dawn Patitucci has lived her entire life in the Chicago area and is a longtime college professor in computer science. She is a Germanophile, a power-tool-wielding handywoman, and an orange male cat enthusiast. The Queen's Prophet is her debut novel.